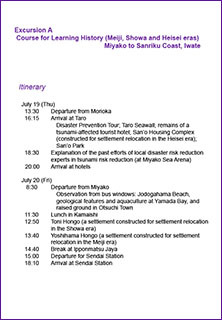 Excursion | Greeting | Global Conference on the International Network of Disaster Studies in Iwate, Japan "Iwate Conference"
To attend the Excursion Tours, please click the “Registration” button below and register online. 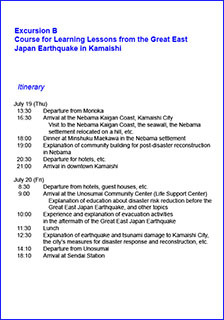 *For all three courses: Transportation (bus), two lunches, and a dinner will be arranged by the organizer. 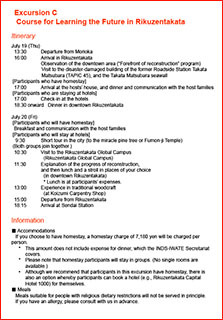 Participants are asked to pay for their own accommodation and breakfast. *The time to start and end the tour is approximately the same for all courses. *After arriving at Sendai Station, it is possible to travel to Tokyo, Kyoto, Osaka, or Kobe within the same day by bullet train.